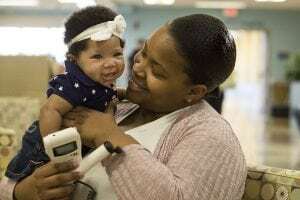 When new mom Ebony gazes at three-month-old My’laie (pronounced my-LAY), she faces an understandable dilemma: Which adorable baby part does she love the most? For all these beloved baby parts, it was actually baby My’laie’s heart that got her mother’s attention first, and it likely saved her life. During pregnancy, Ebony had been evaluated as high risk due to episodes of fetal arrhythmia, or abnormal heart rhythm, first picked up by her physician in Sarasota. A normal heart rate in utero is between 100 – 180 beats per minute. Protracted episodes that are higher or lower than that can be very dangerous, even deadly, for the fetus. One check-up revealed the heart rate was 220 beats per minute. Ebony was hospitalized briefly, and then referred to Johns Hopkins All Children’s pediatric cardiologist Grace Freire, M.D. Freire specializes in fetal cardiology. Although most arrhythmia is transient and benign, she says severe sustained arrhythmia can pose great risks to an unborn child. Conventionally, pregnant moms who are at higher risk for arrhythmia are either hospitalized for long periods so they can be monitored, or they may be required to visit their physician frequently. Sometimes a doctor will recommend the baby be delivered early. But Freire did not require that of Ebony. Instead, the doctor sent Ebony home with a tool to do her own monitoring with extra doctor visits only when necessary. It was a simple fetal heart monitor, no more complicated than the kind you can buy at a Toys “R” Us. Ebony was taught how to apply a gel to her belly and how to move the tool around to locate the baby’s heartbeat three times a day. A digital display reveals the beats per minute. Ebony kept a log of the fetal heart rates, which she was able to share with the doctor. Since 2014, Freire has made the “Home Fetal Arrhythmia Monitoring” program a standard of care for monitoring fetuses that develop arrhythmias. Since then, she has been conducting research on how this new monitoring at home compares to conventional office monitoring, by looking at the data the mothers enter at home, as well as the baby’s outcomes. The research results are encouraging. They reveal that not only are the home fetal monitors accurate, but the detection times for problems are shorter and can be life-saving. Because severe fetal arrhythmia cases are rare, the number of study participants is small so far, but Friere continues to collect data. The research results could help make this type of monitoring at home a standard of care across the country. She recently submitted a manuscript with her findings to a leading medical journal for consideration. Ebony says not only was the monitoring simple and convenient, it gave her comfort to see her baby’s heart rate each day. As it turned out, Ebony had reason to worry. At 33 weeks into her pregnancy, during one of her daily monitoring rituals, she detected severe tachycardia. She immediately called her doctor’s office and was brought in for evaluation. Her atrial rates were at 451 and her ventricular rates were at 221 beats per minute—dangerously fast. Ebony was hospitalized for several days and given medication to regulate her baby’s heart rhythm and to get her back on track. The next time Ebony was in the hospital, it would be to welcome a healthy baby into the world. My’laie weighed in at 9 pounds, 5 ounces … lots of hair, and yes, beautiful toes. Visit HopkinsAllChildrens.org/Heart to learn more about the Johns Hopkins All Children’s Heart Institute. Previous post: Walmart and Sam’s Club Celebrate 30 Years of Supporting Miracles!